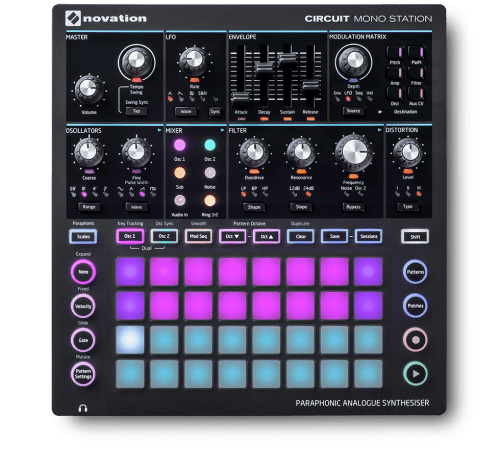 Circuit Mono Station is a paraphonic analogue synthesiser that originates from the Novation Bass Station II, with three sequencer tracks that benefit from the 32 velocity-sensitive RGB pads found on Circuit. The CV, Gate and modulation outputs provide an easy mechanism for controlling separate hardware. 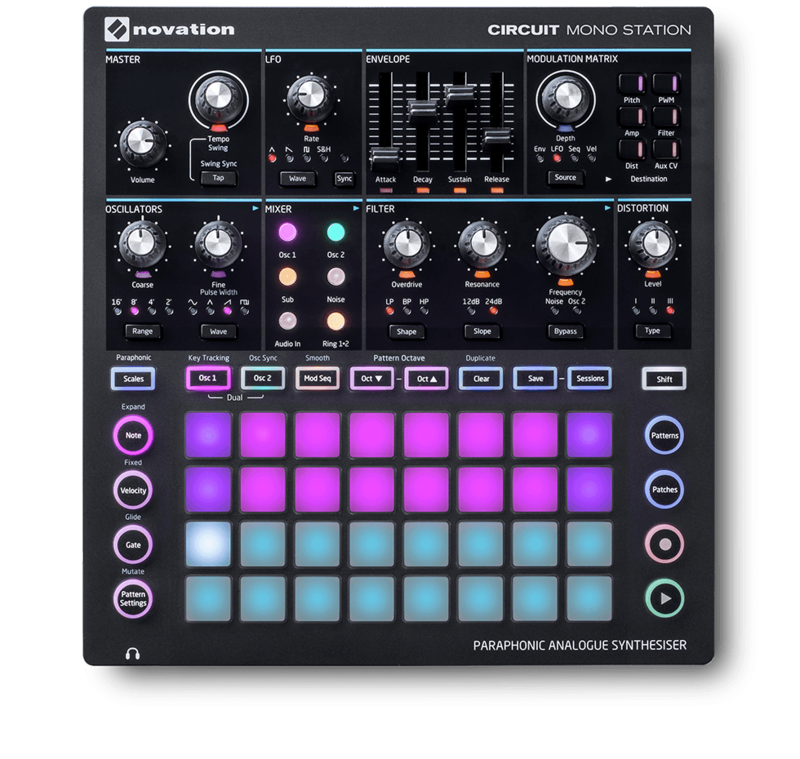 You can plug Circuit Mono Station into your Mac or PC via USB and start playing. It also has MIDI In, Out and Thru, so you can connect your other MIDI gear. Passing an audio signal through the audio input opens up a world of analogue filtration and distortion. Using the audio input with the mod sequencer, you can modulate, evolve and process your source in entirely new ways. Both monophonic and paraphonic modes are available, with each oscillator controlled by its own sequencer. In total, there’s two oscillator sequencers and one modulation sequencer. You can alter Gate length, switch patterns instantly, choose sync rate and mutate patterns. Individually control oscillators Two oscillators with individual control of sync and tuning parameters. Get the frequency band you want High-pass, low-pass and band-pass filters with slopes of 12dB and 24dB. Three distortion modes Classic Bass Station, new fuzz or a mixture of both. Monophonic and paraphonic Monophonic and paraphonic modes with individual glide control. Adaptable modulation system Four-by-eight modulation matrix that enables complex alteration and routing. Patches at your fingertips Load and save up to 64 patches on the device. Three sequencer tracks Two oscillator sequencers and one modulation sequencer. Connect to hardware and software CV, Gate and modulation outputs for controlling separate hardware. Connect and sync to your music software and MIDI-compatible hardware. Modulate, evolve and process your source through the audio input. Store unlimited sounds Backup patches and sessions with Components.